No joke, this tablet is damn cool! If you have followed the Entropy Blog over the past several years you will know we are unabashed iPad Pro fanatics. We were all over the first 12.9-inch iPad Pro way back in 2015, and even launched a series of posts detailing life in a software development agency using only the iPad Pro as our main machine. So yeah, we love that machine. But here's the thing, although iOS 11 brought a TON of new (and badly needed) features to the iPad Pro (including a desktop-like Dock, better multitasking, and improved gestures), the empirical usage of Apple's touchscreen 2-1 stayed pretty much the same. In other words, although we can now do more by using multiple apps in a grid format on the screen, even the latest Betas of iOS 12 keep us wanting more. More windowing control. More PC-like app switching. More access to our files and storage system. The 'baby steps' of gradual updates to the iPad Pro software for power users have been painfully glacial. Enter the much-maligned Samsung Tab Series. Now we're with you here - an Android tablet in 2018 seems like a total anachronism. Even Google has bowed out gracefully from the tablet game (remember the Pixel C? ), with plans for any new tablet releases apparently shelved in favour of high-end chromebooks like last year's Pixelbook (capable of running Android Apps, incidentally). So why on earth does Samsung persevere? And is there any room for a new high-end Android tablet when every manufacturer from Google to LG and Sony have pretty much given up? Well, folks - we're honestly shocked to say that Samsung's latest tablet (the Galaxy Tab S4) actually proves there's some life in this category yet. We've spent about a week with the new product (half of that time plugged into Samsung's new keyboard cover), and can honestly report that it's been an extremely enjoyable experience thusfar. First off - to be upfront, the internals are nowhere near as powerful as the iPad Pro. Samsung is using last year's Qualcomm Snapdragon 835 processor, a chip already surpassed in this year's Galaxy Note 9 (using the Snapdragon 845), and even the RAM falls below flagship Android devices of 2018. But what it lacks in power in makes up for in flexibility and features. Using the Tab S4 as a tablet, multitasking is simply amazing. Not only can the tablet do the iPad Pro trick of split screen multitasking, but every window can actually be resized to create a PC-like floating window effect. Multiple floating windows can be minimised and grouped so you can enjoy full screen Web browsing, while easily jumping and back and forth to your email, Slack, or Twitter feed. Plug in the optional keyboard cover, and things get super-interesting. 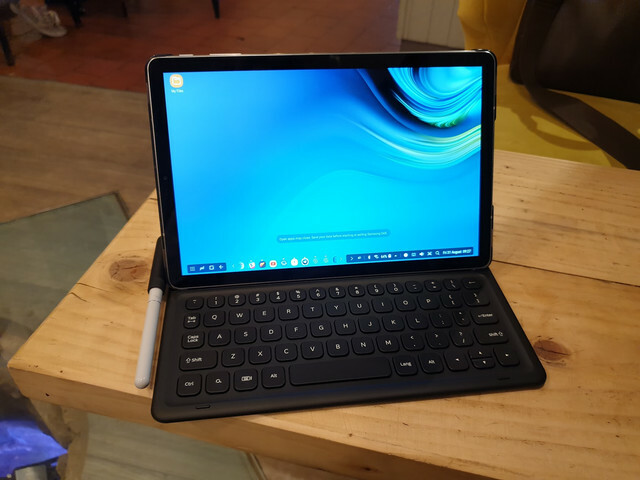 Once docked, the Tab S4 goes into Samsung's 'DeX mode', basically a Windows-like interface where all apps immediately open in floating windows, notifications become taskbar items, and a fully functional desktop (with icons) becomes the primary canvas. And the S-Pen? Well, it may actually best Apple Pencil in terms of latency and performance. Crazy, huh? Admittedly, it's not perfect. Many apps don't behave well in floating mode, and the move between DeX and non-DeX interfaces is a bit clunky (requiring a soft restart of the launcher). But give credit to Samsung, they are seriously pushing the boat out here - trying to milk as much power from a mobile processor as possible, and in the process creating one of the most thoughtful and feature-packed tablet experiences we've seen to date. So will we start a new Web series on replacing our MacBooks with a Tab S4? Not likely. For now, this remains a tempting glimpse into where mobile processor-powered tablet-PCs are headed. And while this may not be daily driver material - it's still a heck of a lot of fun. Props to Samsung for keeping the Android tablet torch burning - let's hope it doesn't go out anytime soon!